I was at the supermarket deliberating what I was going to make for dinner and noticed a bunch of radishes. 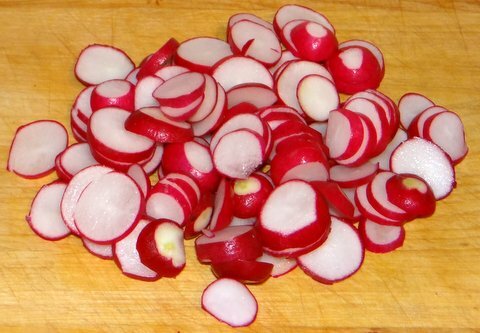 I don’t eat many radishes and when I do, I usually eat them raw. 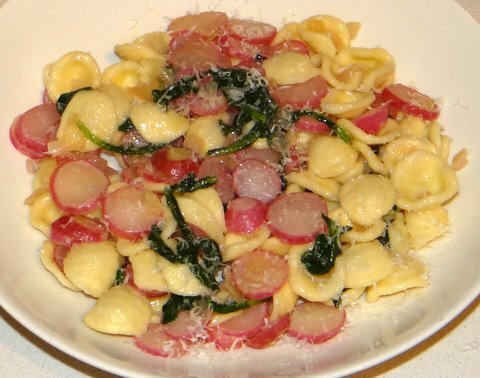 But I remembered reading somewhere on a blog (don’t remember which one, might have been Emmy’s) that you can also eat the leaves and so I decided to make pasta with radishes. I turned out quite nice and was definitely something different. 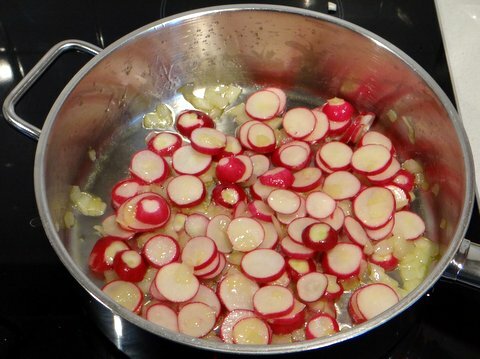 Cooking takes the edge off the radishes sharp taste. I might add pancetta next time or something else to complete the taste profile, but this was nice as it is. 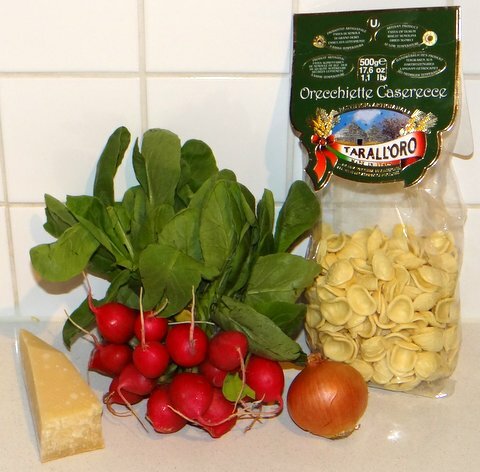 Although I’ve never seen this in Italy it is Italian-style at its best: ready in the time it takes to cook the pasta, simple, healthy and tasty. 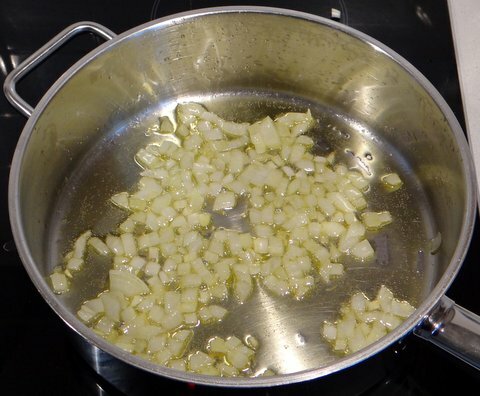 Bring a pot of water to a boil, add pasta and salt and cook al dente according to package instructions. Meanwhile, cut the roots and the greens off the radishes and wash them. 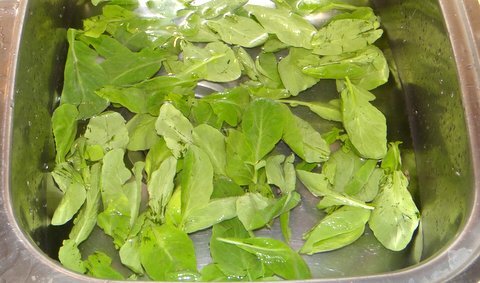 Use only the leaves from the greens and wash those as well, washing twice or until there is no sand left. Cut the radishes into thin rounds. 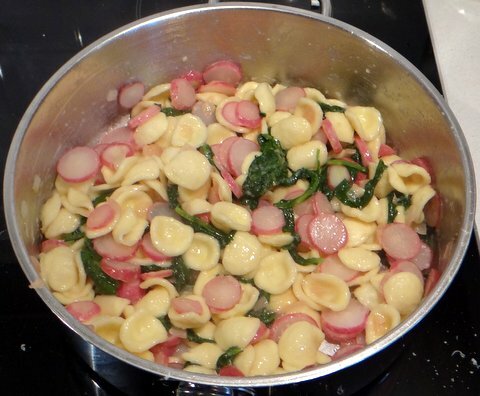 Add the radishes and sauté until also those are translucent. 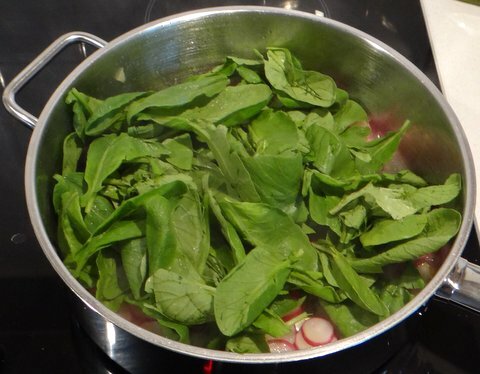 Add the leaves and sauté until those have whithered. Season with salt and freshly ground black pepper. Drain the pasta and reserve some of the cooking water. Add the pasta, a bit of the cooking water and freshly grated parmigiano to taste. Toss to mix. 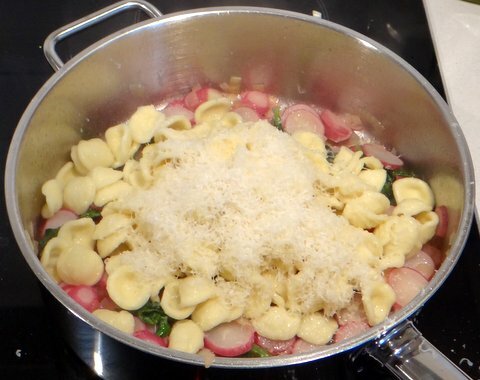 Serve on warm plates, sprinkled with additional parmigiano. 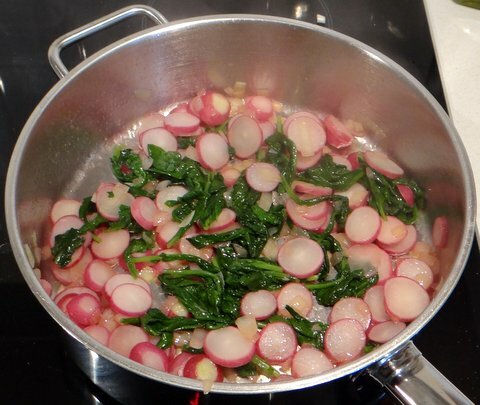 Radishes are great both cooked and raw, we eat their leaves all the time sautee’d with garlic and oil or in stews and soups! Fantastico! !